Once known as the political as well as political capital of Andhra Pradesh, Vijayawada is a vital rail and road link between the North and the South and is now known as ‘the city that never sleeps’. A major business centre, it is the hub of commercial activity in the coastal area. The Prakasam Barrage, the Kanakadurga temple, the St. Mary’s Church and the Moghalrajapuram caves are some of the attractions in the city, known for its cinema theaters and typically Andhra food. The number of canals criss-crossing the city gives it a Venetian look. Vijayawada is well connected by road and rail with all major cities in Andhra Pradesh and other important towns in India. Situated 270 km from Hyderabad between river Krishna and its tributary Budameru, the city is spread over the rich coastal delta of Andhra Pradesh. Kanaka Durga Temple: One of the most popular temples in and around Vijayawada, it is located on a hill Indrakeeladri overlooking the city as well as the River Krishna. One can either motor up the ghat road or take to the steps on foot. Inscriptions of different dynasties are found in the temple, During Dasara, lakhs of devotees from the city and its environs throng the temple after a holy dip in the River Krishna close by. Gunadala Matha Shrine: In 1925, Rf. Arlati, the then Rector of St. Josseph’s Orphanage at Gundala, installed as statue of Our Lady and later a church was built and consecrated in 1971, now popularly known as St. Mary’s Church. Since then the Feast of Our Lady of Lourdes became an annual event here, attended by hundreds of people. The Church is situated on a hillock on the eastern side of the city. Prakasam Barrage: Built across the river Krishna, Prakasam Barrage has created a panoramic lake. Its three canals that run through the city give Vijayawada a Venetian look. Rajiv Gandhi Park: Created by the Vijayawada Municipal Corporation with great care, this park welcomes the tourists at the entrance of the city with its impressive horticultural network. A mini zoo and a musical fountain are added to it. Gandhi Hill: The first Gandhi Memorial with seven Stupas in the country was constructed on this hill at height of 500 ft. Stupa was unveiled on 6th October, 1968 by Dr. Zakir Hussain, the then President of India. Gandhi Memorial Library, a Sound and Light Show on Mahatma Gandhi’s life and a planetarium are the other attractions. Victoria Museum: A place for archaeology lovers, Victoria Museum has a carefully preserved collection of ancient sculptures, paintings, idols, weapons, cutlery and inscriptions. Mogalarajapuram Caves: These caves are said to be excavated in 5th Century A.D. These caves are reputed to be the fist of their kind in South India. The idols of Lord Nataraja, Vinayaka and Arthanareeswara are carved here. Bhavani Island: Perhaps one of the largest Islands in a river, Bhavani Island is located on Krishna River close to the city. AP Tourism has plans to convert this 133-acre island in the River Krishna into an attractive tourist spot. Journey to the island by boat is very pleasant. Hazrat Bal Mosque: A holy relic of the Prophet Mohammed is kept here and displayed once a year. A large number of Non-Muslims too join the celebrations. Bavikonda: Most parts of north coastal Andhra Pradesh were part of the ancient Kalinga Kingdom. At Bavikonda near Vishakhapatnam, an extensive Buddhist settlement was unearthed. The name Baikonda means hill of the wells. This could be because the settlement had its own drinking water wells. There are several stupas and a big congregation hall. The site is approachable from the port city of Vishakhapatnam. Undavalli Caves: 8 km from Vijayawada, these caves are said to be carved in 7th century A.D. Buddhist monks used this two-storeyed cave structure as a rest house during the monsoon, A huge monolith of the Lord Buddha in reclining posture is a magnificent sight. 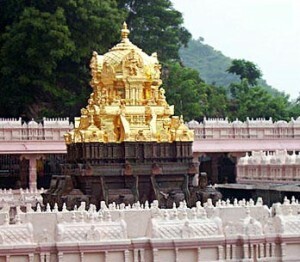 Mangalagiri: 12 km from Vijayawada is the renowned temple of Lord Narasimha in Mangalagiri, on a hillock. The unique feature of this temple is that the mouth of the idol accepts half the quantity of Panakam (jiggery dissolved in water) offered by devotees, irrespective of the size of the vessel. Hinkar Thirtha (Jain Temple), Mangalagiri: A Jain temple being constructed is almost nearing completion. With great artistic work, it is slated to be the biggest Jain temple in the region. Kondapalli Fort: Kondapalli village is situated 16 km from Vijayawada. A 7h century fort on the hill with an impressive three storeyed rock tower was witness to the glory of many dynasties. It served as business centre. Finally the British rulers used the fort as a military training base. A good picnic spot, the village is famous for toy making with lightweight wood available on the hill forest. These toys are famous world-over as “Kondapalli toys”. Manginapudi Beach: Located near Machilipatnam, lakhs of pilgrims take a holy dip here in the sea during Magha Poornima, as it is ideal for sea bathing. Fabric printing with natural colours known as Kalamakari and gold covering are the major village industries, famous worldwide. The Panduranga Swamy Temple, which is said to be similar to the temple at Pandaripur, is a famous pilgrim centre. Kuchipudi: About 60 km from Vijayawada, this is the birthplace of Siddhendra Yogi, the originator of Kuchipudi dance form, famous throughout the world. A dance school by the Siddhendra Kala Kshetram trains many students every year, promoting the Kuchipudi dance form. Amaravati: Amaravati, formerly called Dhanyakataka and Andhranagari, is one of the most important Buddhist sites in the country. Acharya Nagarjuna constructed the country’s largest stupa here, 2000 years back. Amaravati is considered the most sacred pilgrim centre for Buddhists in South India. It also has an Amareswara temple. Ghantasala: The stupa here contains a cube made of solid bricks and inscribed with the 12 constellations of the Zodiac. Other Buddhist ruins have also been excavated. The village is about 60 km from Vijayawada and some 20 km from Machilipatnam, the district headquarters town. Regular bus services are run from either side. Machilipatnam: Machilipatnam on the seacoast is the headquarters town of Krishna District. Known for its Kalamkari art, it was major port once and was known as “Bandar”. Just 11 km of Masula, as the town is also known, is the Manginapudi beach. In terms of beauty, this beach outshines the shoreline at Machilipatnam, so much so that Manginapudi is considered to be the beach for both the places, Machilipatnam is 70 km from the major city of Vijayawada and buses ply regularly between the places. Private transport is also available. Krishna Sanctuary: It is located at Krishna and Guntur districts. Its area is 195 Sqkm. Notable Flora and Fauna are mangrove forests on the estuary of river Krishna harboring Fishing Cat, Otter, Jackal, Estuarine crocodile and variety of seasonal birds. It is situated about 80 km by road from Vijayawada railway station. Best Season is from October to February. Guntupalli: On a hillock near Kamavarapukota in West Godavari district lies this site, considered to be one of the most beautiful ones in South India. A cave cut into the rocky side of the hill, a circular Chaityagriha and several images of The Buddha enhance the beauty of the site. The village is 85 km from Vijayawada and 45 km from the district headquarters town of Eluru. Kolleru Lake: Located 95 km from Vijayawada, this large fresh water lake attracts several species of birds; The Lake is spread over an area of 300 sq. miles and pelicans from Siberia and Fiji Island are seen here during October and November every year. The famous Peddinti Amma / Jaladurga temple is located here. It is a great picnic spot for bird watchers and nature lovers. Buddhist Sites: Amaravati, Bhattiprolu, Goli, Guntupalli, Ghantasala and Chinna Ganjam are some important Buddhist sites near Vijayawada. Many stupas and viharas were built during the Satavahana and Salivahana dynasties. Chandavaram: In the neighbouring Prakasam disrict lays Chandavaram, on the bank of the Gundlakamma rivulet. The stupa here is unique in that it is double-terraced and located atop a hillock and could be considered the highest in elevation, next only the Dharmarajaka stupa at Taxila. The village is about 150 km from Vijayawada and approachable by road. This entry was posted in Andhra Pradesh, Vijayawada. Bookmark the permalink.